Diamant Noir is among those new chic small restaurants whose chefs are young, creative and energetic; the food could quite well be worth a michelin star. It has not been since the days of J. Maxamin, that Nice has seen the creativity that appears to thriving around town. Restaurants such as: Jouni, Diamant Noir, Sappore, Luc Salsendo, Kai Passion are bringing a new culinary sense to Nice with these young chefs. 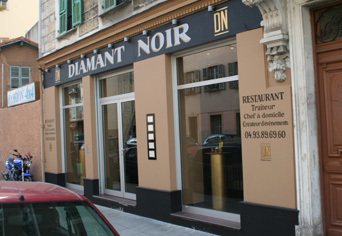 In the case of Diamont Noir the chef Benjamin Bruno is the son of well know Clement Bruno from Lorgues, located about 100 miles from Nice. 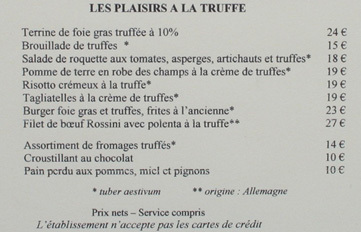 Chef Bruno's cooking remains with an emphasis on truffles. On the day I was there the amuse bouche was simply a thin piece of toasted baguette drizzled with olive oil and topped with a mound of slivered seasonal truffles. 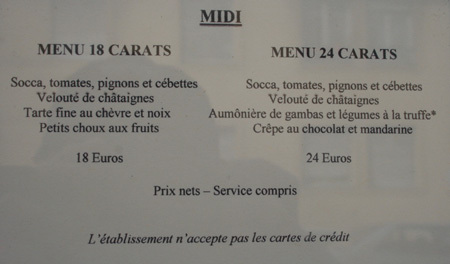 For 24 euros the lunch menu --all served on the same plate -- consisted of a superb tuna tartare; a mushroom and truffle veloute ; a thick piece of beef with truffle sauce; and a fruit crepe with mango sauce. Having all the dishes served on the same plate did not seem to deter from the meal considering all was had for only 24 euros. And, while the restaurant did not completely fill up for lunch, those who walked in to reserve for dinner were told that they were fully booked and politely given a card to call for another day. 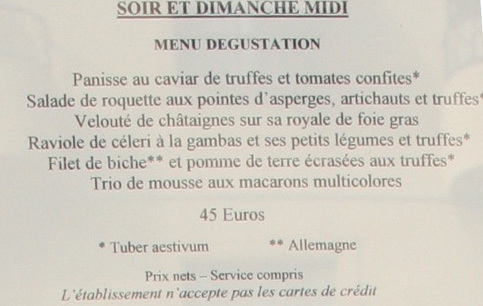 The dinner menu is far more extensive than the lunch menu. The restaurant is very small (only 24 seats, of which 6 are in the center of the restaurant at a community table). A widescreen TV playing video music (low volume) worked well, bringing an interesting tone to the restaurant.